A liner ship, if you are unfamiliar with the term, refers to a cargo ship that has the capability of transporting warehouses (yes, plural!) of merchandise. The goal is to maximize efficiency when transporting goods by using one ship for a myriad of companies. Currently, there are over 6,000 containerships in play, with about 400 companies offering liner services around the world. Many of these ships were built in 1980 and will travel the distance from earth to the moon practically ten times! That’s nearly 2 million miles! Liner shipping focuses primarily on high-capacity ships that operate via fixed routes and schedules. 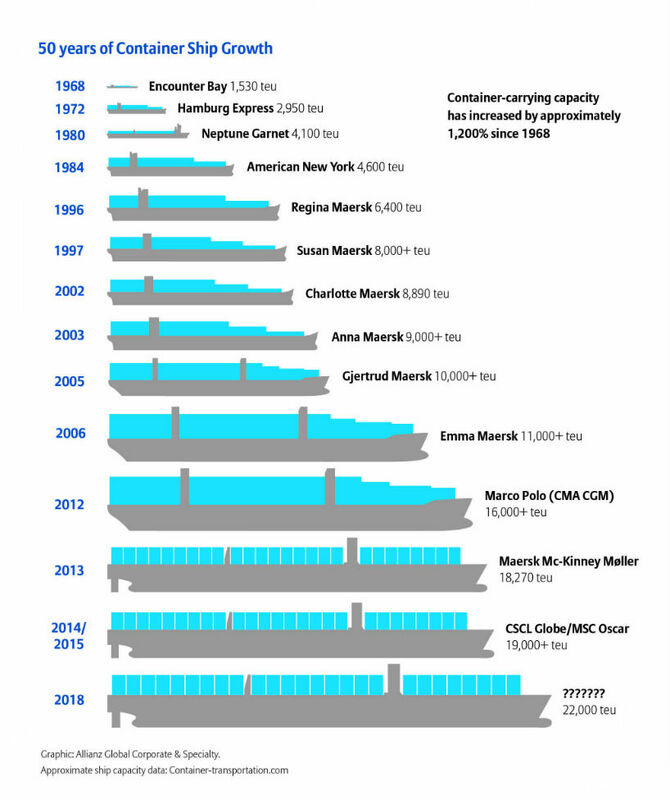 These sea-based ships carry about 60% of all goods moved internationally every year. Most of them are outfitted to securely accommodate commonly used 20-foot and 40-foot, plus 45-foot and 48-foot containers. Some ships fit freight containers up to 53-feet long. These enormous ships have only gotten bigger over the last 50 years. In that time, they have gone from carrying just 1,500 TEU to carrying over 12,000 TEU today. The picture below depicts the 1,200% capacity growth since 1968. Some of the biggest container ships in the world today are a whopping 1,300 feet long and 180 feet wide! In addition to being outfitted to carry more goods in one trip, including shipments from different companies, they are more fuel efficient! In fact, a recent study by Lloyd’s Register discovered that, in 23 years (from 1985 to 2008), fuel efficiency increase by 35%. Think about the fixed schedule of a train route or a bus line. This system is very similar to the regular service scheduled on liner containerships. 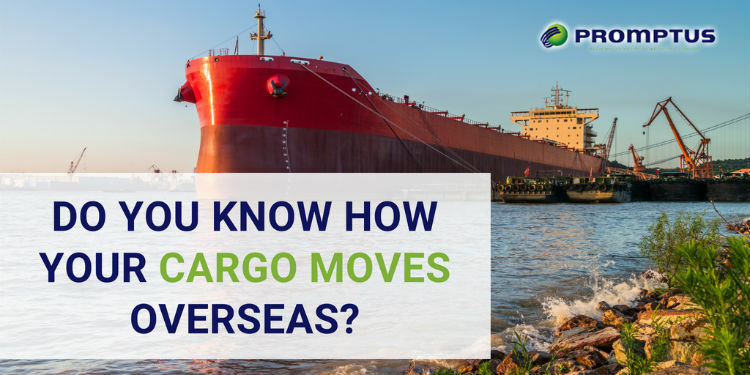 Ultimately, the concept of shipping is simple: the manufacturer sends the goods over via a transit system – in this case, ocean shipping – and they travel on a designated route until they arrive at the destination port. But actually, there is so much more to the transit story of how your favorite pair of shoes makes it way to your local retailer. You, the consumer, has demanded an increase in the latest style of tennis shoe. In response, your local retailer places an order from the manufacturer in China. They arrange a shipment of 500 brand new tennis shoes to be brought over via a freight forwarder. As per the instruction of the freight forwarder, a trucking company will arrive at the Chinese factory. Here, they load up the order of 500 new shoes, along with any other orders placed by other retailers. They are loaded into the freight containers and sealed with heavy duty locks. The freight forwarding company directs the trucking to delivery the container to a port in China, where workers load it onto a shipping line. Here, transport documents will be requested by the government to ensure everything is legitimate. Once safely loaded on the container ship, the cargo heads towards its destination port. Upon arrival, the vessel will present the necessary information to receive clearance to dock. Once it has arrived, dock workers will assist with unloading the containers that have the shoes. If Customs selects the cargo for inspection, it will open and thoroughly check it to ensure nothing is wrong. Once cleared, they will load it onto the next mode of transport, usually a trailer truck. Now the tennis shoes have officially arrived in the country and are on their way to you. The container with the shoes arrives at an import distribution center, typically located nearby, where the cargo will be unloaded and prepared. Once they are good to go, the 500 brand new tennis shoes will arrive at the retailer. At Promptus LLC, we offer full-scale logistics services that will help you every step of the way. Our team of air & ocean freight forwarders can help transport your merchandise worldwide, even if it is a multimodal shipment. We are C-TPAT certified and have a number of resources available to help with international import/export services. Call us at 1-877-776-6799 to get a Free Quote today! Do You Know The Right Marine Freight Container For Your Shipping Needs?